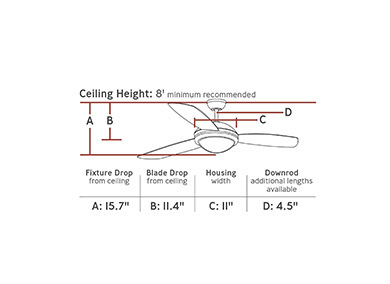 The Discus Trio is a three-blade version of the popular 52” Discus ceiling fan by Monte Carlo. With a minimalist, contemporary design, and three color options, two of which with reversible dual finish blades, it can complement a wide variety of room décor. The Discus Trio features an integrated 18W LED downlight with 700 net lumens of output, 2700K CCT and a CRI of 80+. An optional finishing cap is available for use without the light. Damp-rated for indoor/outdoor use, the Discus Trio also comes with a hand-held remote with four speeds, reverse and LED light dimmer. Includes Wall / Hand Remote with reverse and downlight.